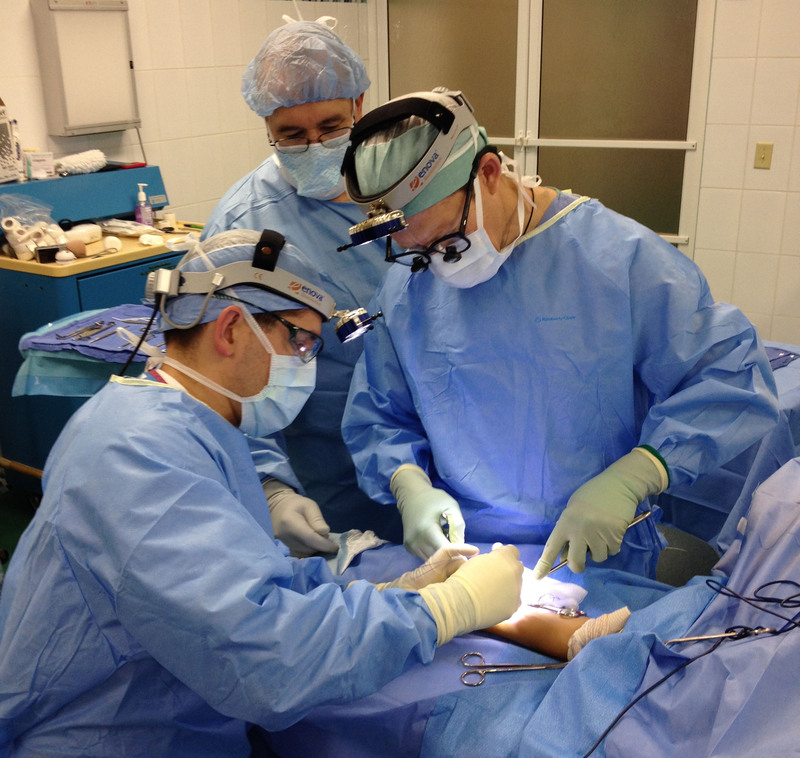 Orthopaedic Surgeons Dr. Ken Noonan and Dr. John Foust performing surgery on mission trip in Honduras. Zambia, Bolivia, and Honduras are all beautiful countries. But they are also countries with some of the poorest medical care in the world. Every year doctors and dentists volunteer their time and skills on medical mission trips for a week or two. The time spent isn’t a vacation. In fact, mission surgeons and medical personnel work nearly around the clock to evaluate patients and perform surgeries. Over the years, hundreds of doctors and dentists have used Enova LED surgical headlights on medical mission trips. They’ve gone to Central America, South America, Asia and Africa, often traveling with nonprofit organizations such as Operation Smile, Healing The Children, Sharing Resources Worldwide, Cascade Medical Team, Smile Network, Anidaso Health and others. The number of medical mission trips continues to increase each year. In the first month-and-a-half of 2014, Enova has already donated 12 surgical headlights for mission trips. According to Jim Nelson, Enova’s Director of Sales and Marketing, “We try to keep a number of used headlights on hand to donate for mission trips. When I started with Enova, we were donating an older model—the D-100. As we’ve come out with newer headlight models, what is available for mission trips has evolved too.” Today, surgeons requesting Enova surgical headlights for mission trips are likely to receive the Iris S-100, the Iris D-200, which is the world’s brightest LED headlight, or the XLT-125, Enova’s newest and most popular headlight. Why are Enova LED surgical headlights so great for mission trips? “First, you have to realize that mission surgeons are working in poor, rural and remote communities,” says Jim. “We know surgeons like how portable and robust our headlights are; they also appreciate the long battery life.” Enova’s larger battery pack, the B4X, can last up to 24 hours when used with the Iris S-100, up to 12 hours when used with the Iris D-200, and up to 24 hours with the Enova XLT-125. Click here to read about Plastic Surgeon Dr. Jessica Collins’ story about being a volunteer surgeon on an Operation Smile Mission in Brazil, published in August 2013. Enova Illumination supports medical mission work around the world. Surgeons donate their time; we donate our surgical headlights. Hundreds of doctors and dentists have used our LED surgical headlights to perform surgeries in rural and remote communities throughout Central and South America, Asia and Africa. Enova requires a $100 fee to cover shipping, handling, prep, and cleaning of LED headlights used on mission trips. Limit of 2 headlight systems per trip. Learn more and complete application form. Browse free articles and videos to help you get acquainted with the Enova product line of Illumination Headlamps.